The Company Fuchs stays for premium quality and excellent taste. To guarantee this, all row materials are subject to systematic and regular control activities in the company’s own laboratory as well as in other external qualified laboratories to verify their suitability and accordance with the high standards determined by food law. The same control process is related to the final products as well as the semi-finished products. 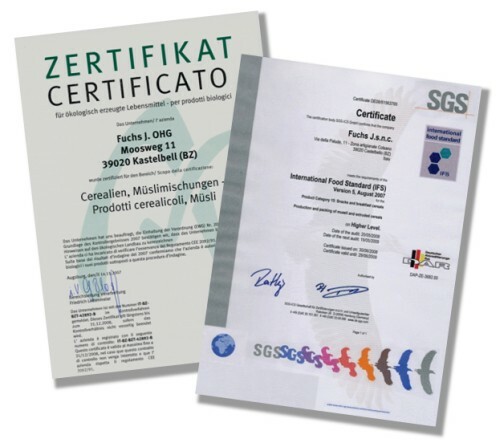 Basic principles for achieving highest quality levels are the quality management system HACCP, IFS (International Food Standard) and the prescription (EWG) Nr. 2092/91 about ecological agriculture. Every producer must guarantee the safety of its products. The IFS supports the companies in fulfilling the las-prescriptions, and helps them constantly to improve the consumers’ safety through the application of general internationally recognized audit standards. Organic products must be originated by controlled ecological cultivation; they must not be genetically modified, and planted without the use of any kind of pesticides, chemical and artificial fertilizers.